Napoleon Hill once noted; “Cherish your visions and your dreams as they are the children of your soul, the blueprints of your ultimate achievements”. For one of Ligi Ndogo’s directors Chris Amimo, this would be an ideal statement to sum up his achievements thus far. The Lenana School and University of Nairobi Alumni, Amimo played rugby for most of his school life; both in high school and in University. But, he always had that passion for soccer and hence ventured into the field. Not actively as a player, but a major stakeholder in the line of developing and nurturing talent. Though he still maintains that what Ligi Ndogo has done is just the tip of the entire iceberg, the academy has done what many would have considered a gigantic task to pursue. The Ngong road based academy has for the past ten years been working silently towards the growth and development of youth both from the slums of Kibera, its environs and uptown. Think of Genk’s Ayub Timbe, Empoli’s Paul Thiong’o, Sofapaka’s Humphrey Mieno, Feynord’s John Videtti among others, and you will definitely think of Ligi Ndogo. “Soccer was always a passion to me. I never got to play soccer since I was influenced to play Rugby both in high school and Campus. I have played club Rugby for Mean Machine and Mwamba. I also did a little bit of basketball”, says Amimo. “But since 1996 after clearing campus, I started getting engaged in soccer activities; planning events for corporates. Soccer was a passion and there was no way I could just let that go into the drains”, he adds. “It was always thought that talent comes from Eastlands, or in the slum areas. But that is not true. There is also talent uptown. That is why we thought of putting up the facility here on Ngong’ road. But that did not mean that we take kids from the rich sides only. We also took kids from Kawangware and Kibera. We provided a conducive atmosphere where both could play without feeling downtrodden”, Amimo says. Ligi Ndogo started off with about 40 kids and 4 coaches and the age brackets of between 8-12. They did not have much facility but with the resilience and passion driven desire, Amimo,his partners and dedicated of crew soldiered on despite the difficulties. “It has been a massive case of growth. Right now we have over 400 kids spread in our four centers coached by 25 coaches. We have been going to Manchester in the United Kingdom every year since 2004 for the Umbro Cup. Our Under 11 side won the cup in 2007 and won the plate in 2008. In the same year, the Under 16 also won the plate. It has been great exposure to our kids as well as giving them a chance to visit the world. We have also participated in tournaments in Uganda and Tanzania”, he adds. The centre has been a nurturing pot for upcoming players, some of whom are now plying their trade out of the country. Others are top performers in the local leagues. The academy also works hard to ensure all their coaches attain top notch coaching trainings. “Some of the players whom we have grown at Ligi Ndogo have made it and are going far in their careers. Ayub Timbe,recently called up to the national team and is making first team appearances at Belgian side Genk is our product. Empoli Youth’s Paul Thiong’o has also been with us. John Videtti, the Manchester City player on loan to Feyenoord left when he was 14 years after spending almost two years at Ligi Ndogo. There are two brothers, Karim and Sofian Rersa who are in the Qatari second division side Al Ahly. Humphrey Mieno also passed through our structures when he was between 12 and 14”, he says. However, achieving such success has not been an easy walk in the park. Challenges have been flowing in with immense pressure and for Amimo and co, it is the self drive and the passion that has superceded all the challenges they have faced. “The biggest problem has been the constant wrangles that have bedeviled our football administration. This has scared away potential sponsors who view football as a bed-ridden game and also discouraged teams from participating in leagues. Another huge challenge that we have faced is finance. We have had several sponsors including Brookside, Milo, KCB and NIC, but all of them have been on and off, not consistent. Most of the times we have been self sustaining. It has been expensive and it calls for a lot of sacrifice and we have held on for all this while.”, he says. Currently, his biggest aim is to get the wings of Ligi Ndogo spread all over the country. “With good sponsorship, we can do more that the four centers we have. What we have managed to do is just the tip of the iceberg. Our biggest goal is to go deepest into the grassroots and churn out talent that would have otherwise not been noticed. We aim to open up more and more centers across the country”, he adds. However, something of interest is how they have managed to bring up a young girl, amidst boys. Worth noting is that Ligi Ndogo is a boys’ centre. “We do have some few girls who come in. However, we do not have structured programmes for the girls. Interestingly, one of the girls who came to join in the boys is currently doing very well and was given a sponsorship to the US. She is now back and features for Old is Gold in the women’s league. Her name is Njoki Mutua, she was here from 2002 when we started up to 2007. Khadija Omar is also another of the few. She has found a sponsorship to Matuu girls high school and left when she joined the school in 2010”, he adds. Amimo who mid-wifed the Safaricom Sakata ball challenge says that there is more talent in Kenya to be harnessed only if the administration can take into talent tapping more seriously. “We started off the Sakata ball tournament two years ago and it is now one of the best talent scout in Kenya. A very good example is Abdul Malik Mohamed whom we got from Isiolo. He was a time bomb waiting to explode. 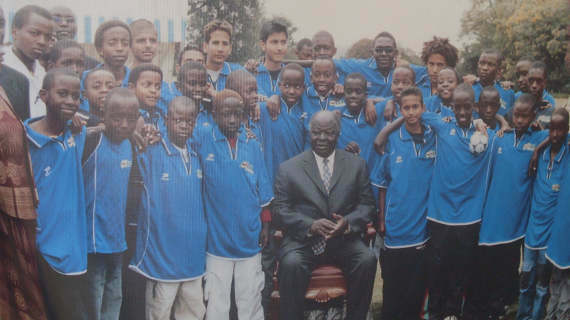 Through Sakata, he was scouted by Gor and consequently went to Sweden for trials. If only we can have more programmes like Sakata and Ligi Ndogo where talent can find a place to be nurtured, then we will find a permanent solution to our soccer mess”, he adds. “I feel that there is so much to be done and that is why programmes like Ligi Ndogo are here. We do not have a scouting system in Kenya unlike the European countries where the moment talent is spotted even if the kid is 4 years old, it will be harnessed with a lot of attention”, he concludes. Currently the Ligi Ndogo senior team that has played itself up the ranks from the district league is leading the Division one League standings after the first round of FKF second tier league matches and is eyeing for promotion to the Premier league next season.